Who is ready for an 80's love song sing-a-long?! Yeah, get ready, because you're about to have a whole lotta ear worms up in your head. 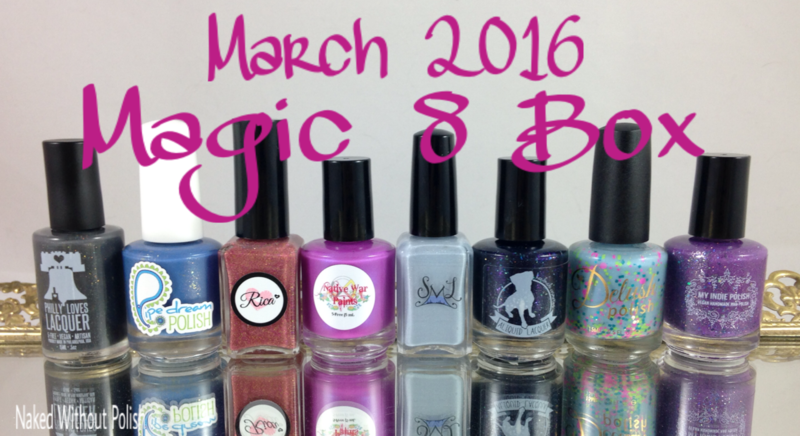 I was invited to swatch and review the March 2016 Magic 8 Box. March's theme is 80's love songs. What a fantastic theme they chose! Also, are you noticing anything different? Yeah, there are 8 polishes in that picture, and yes, that says Magic 8 Box. The Beauty Quartet Box is no more. These wonderful ladies had so much fun with them, they decided to expand. Every box will contain polishes from Philly Loves Lacquer, Smokey Mountain Lacquer, My Indie Polish, and Rica. They will invite 4 other indies to join in each box. This time around they brought in Delush Polish, Pipe Dream Polish, Native War Paints, and ALIQUID Lacquer. I, for one, am loving this change. The more the merrier I like to say! 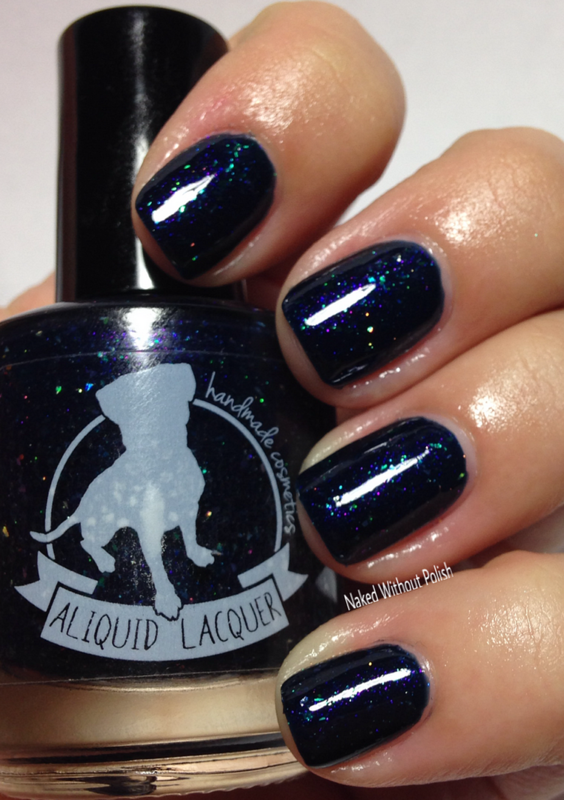 Philly Loves Lacquer created This Much Is True-oo, named after Spandau Ballet's True. This Much is True-oo is a dark, taupe-toned, grey crelly with UCC flakies, crystal chameleon flakies, and gold micro flakies. I've been told there is a hint of unicorn farts in there too. Shown is three thin coats of This Much is True-oo with top coat. This Much is True-oo is a stunner! The more coats you do, the more depth it gets. The combination of the UCC, crystal chameleon, and gold flakies really adds to the layering effect as well. I only had minor issues trying to get some of the larger flakes out of the bottle, but to be honest...you won't care. Those little guys hold their own! 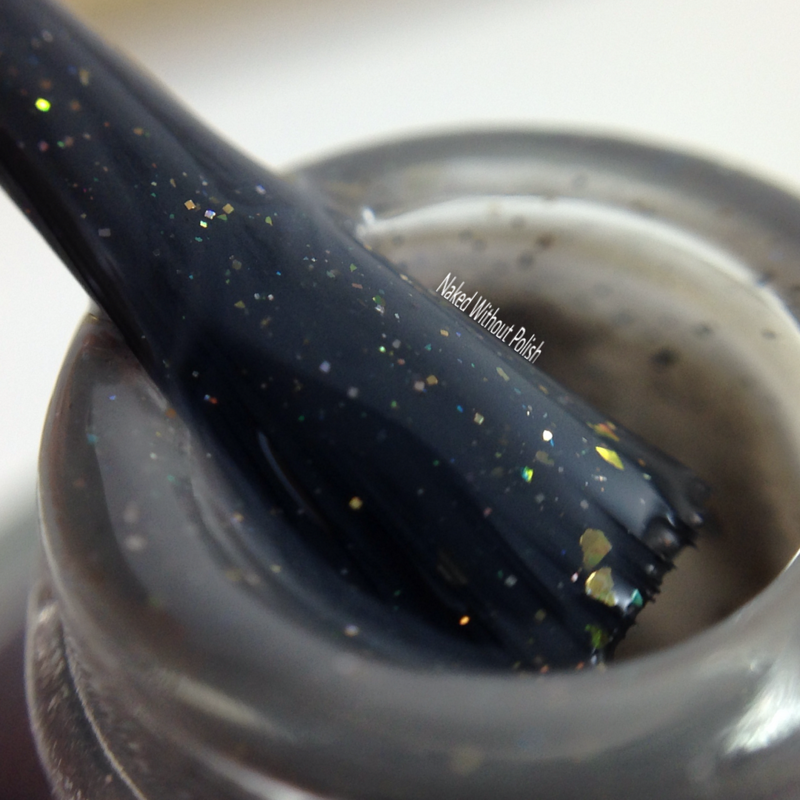 Smokey Mountain Lacquers created Faithfully, named after Journey's Faithfully. 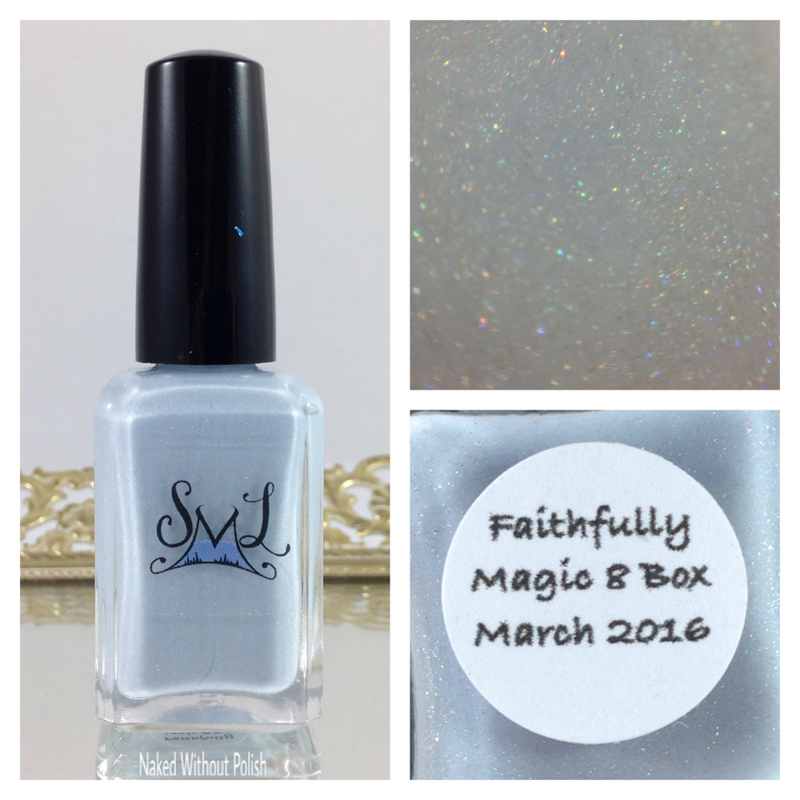 Faithfully is described as "a light blue holo". Shown is three thin coats of Faithfully with top coat. 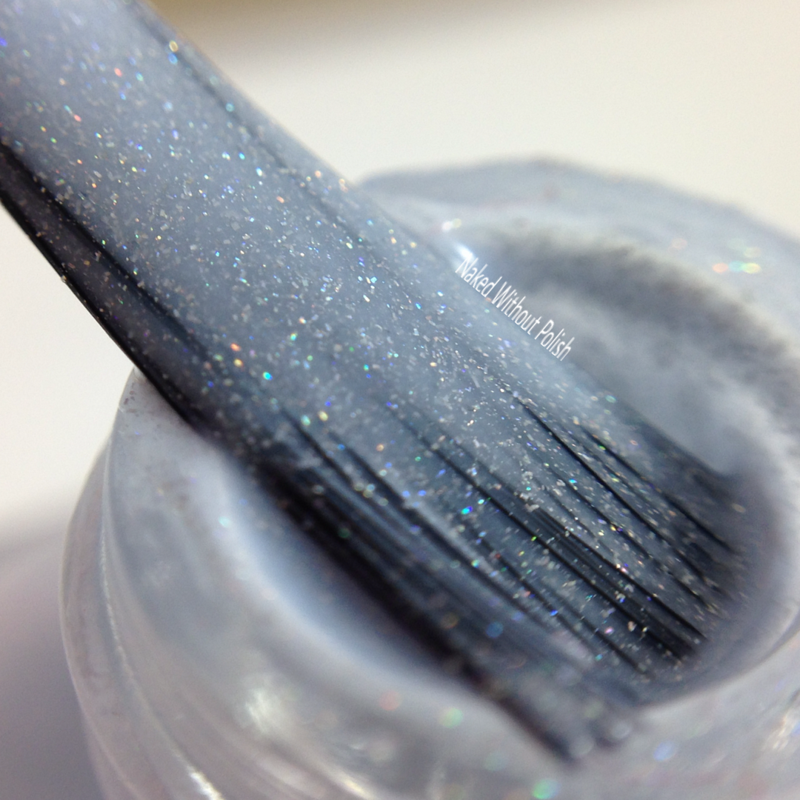 Faithfully is so much more than a light blue holo. 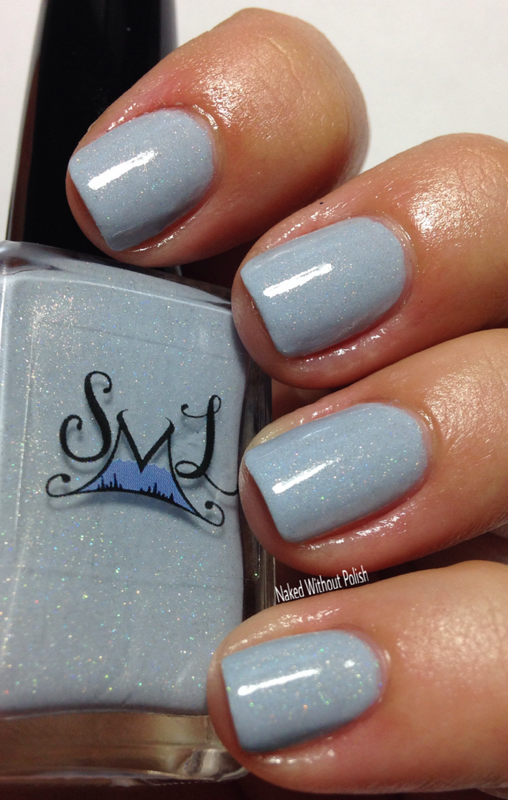 This "light blue" is more the color of a morning fog hovering around the tops of mountains as the sun is rising. It's that perfect pale mixture of blue and grey. In addition to some holo, I could swear there are some silver micro flecks in there too. I saw a bit more shape than just some holo pigment. Beautiful application, a bit streaky with the first coat, but second and third coats evened out and brought it to full opacity. 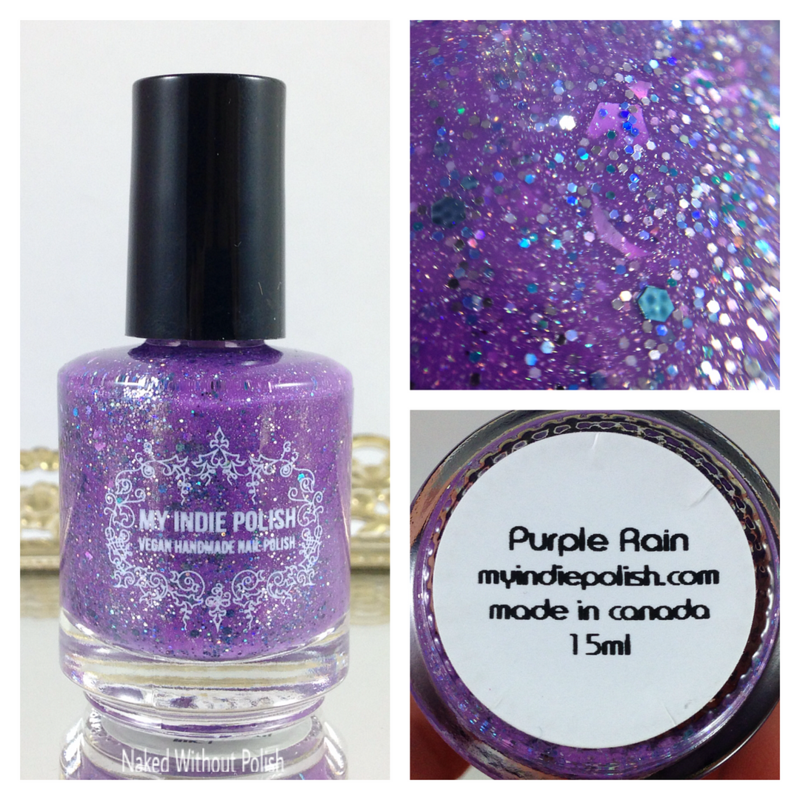 My Indie Polish created Purple Rain, named after Prince and the Revolution's Purple Rain. 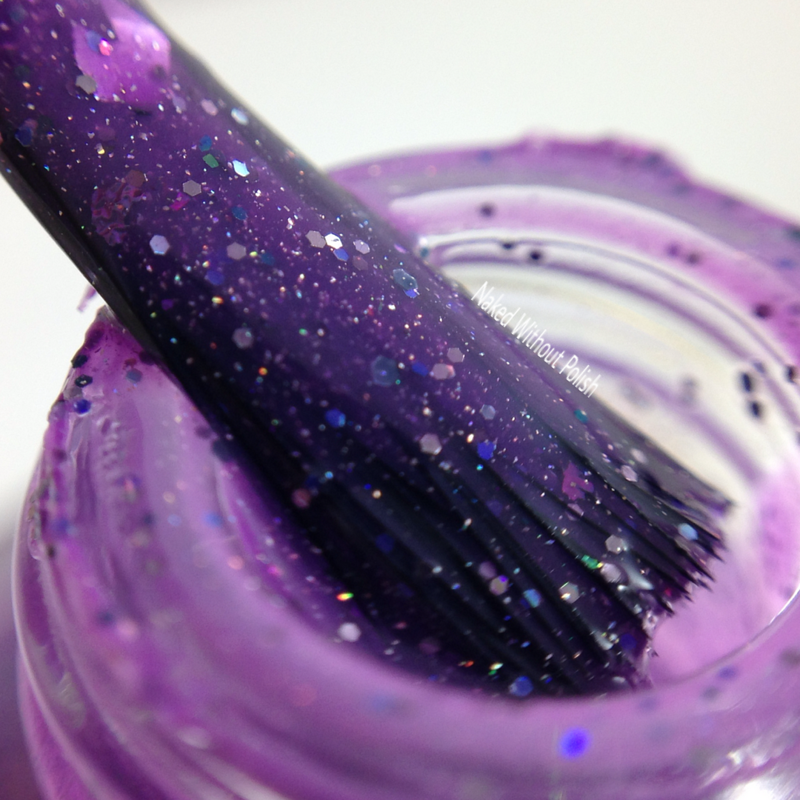 Purple Rain is described as "a medium grape creme with a mixture of holo and galaxy holo glitter in silver, blue, teal, and purple, and flakies". Shown is three coats of Purple Rain with top coat. 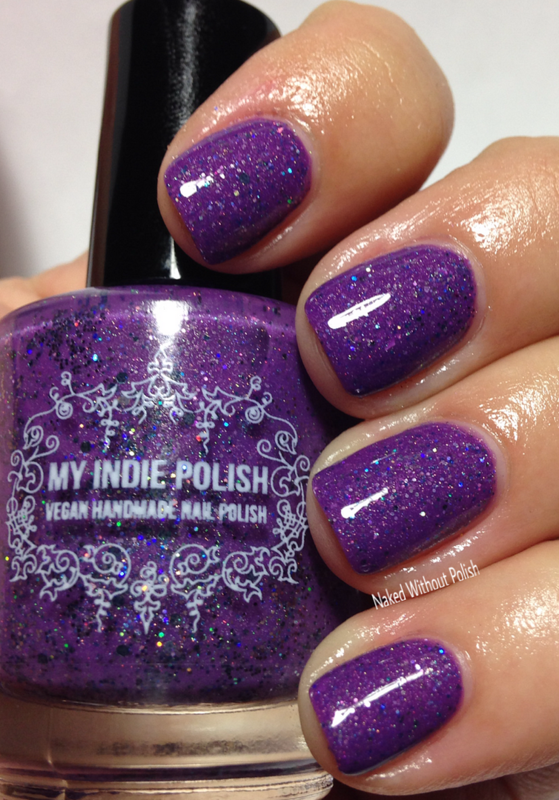 Purple Rain is a gorgeous bunch of glitters dancing in a stunning violet base. Despite the amount of glitter in this bottle, it had a smooth application. Flawless in fact. Be prepared to hum your way through painting your nails with this one. You may even want to keep a hair brush nearby for dry time karaoke. Rica created Time After Time, named after Cyndi Lauper's Time After Time. 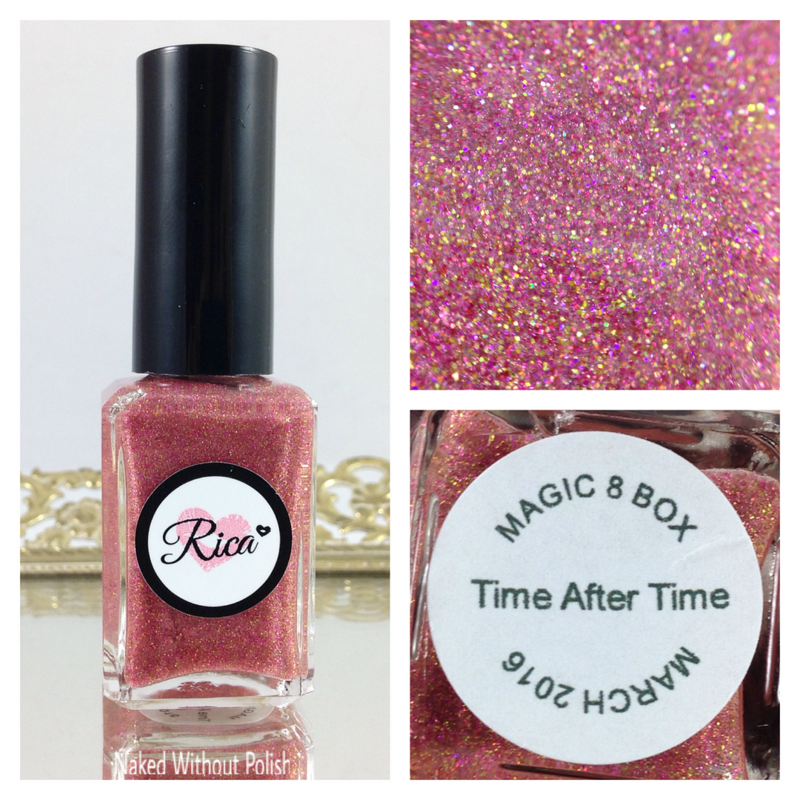 Time After Time is described as "a rose colored micro glitter". Shown is three coats of Time After Time with top coat. 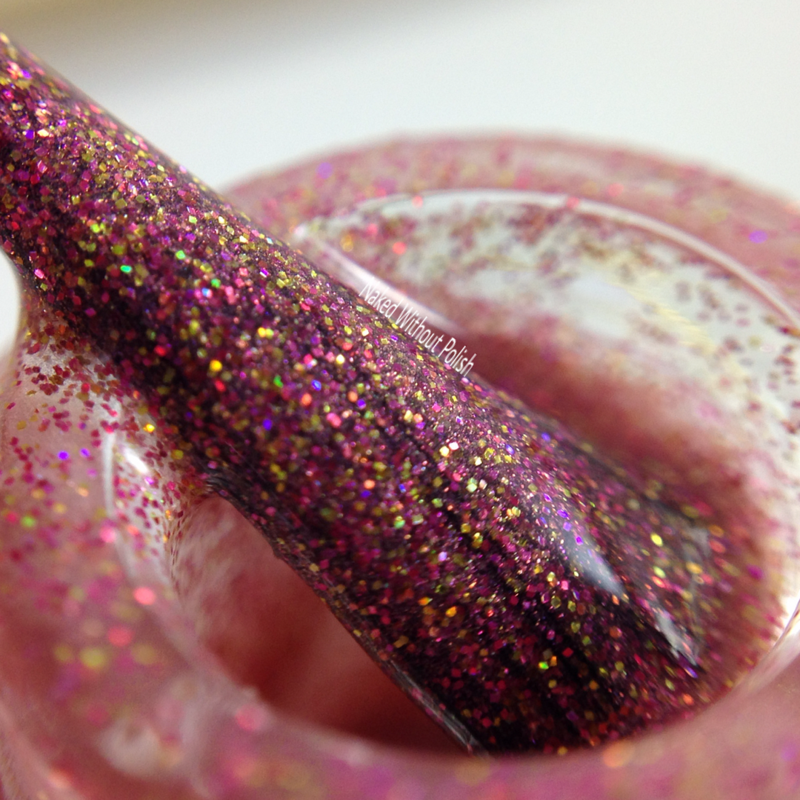 Time After Time is a rose tinted base filled with holo micro glitter in gold, pink, magenta, and red. Crazy smooth application that needed zero clean up. 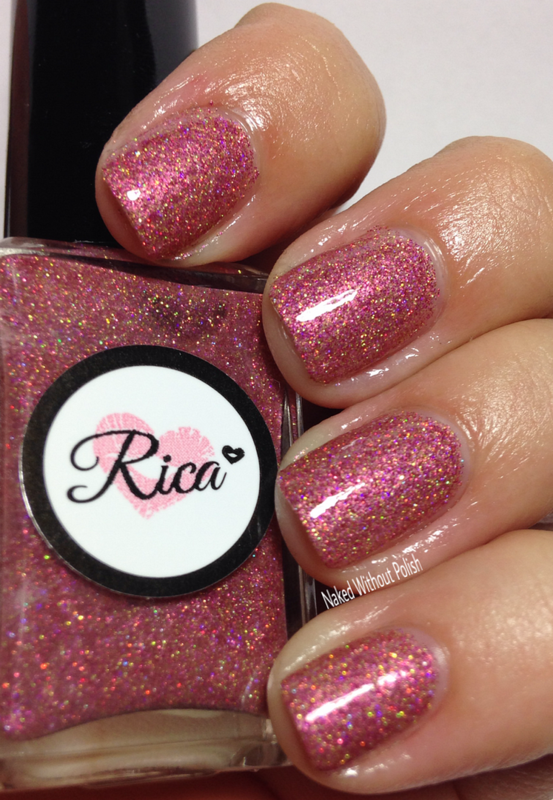 I was quite impressed with my first polish from Rica. Be careful with this one, you'll start singing while you're swatching. If you don't use a really good quick dry top coat, don't blame me, or Ricarda, when you mess up your manicure because you couldn't stop yourself from doing the dance from Romy and Michelle's High School Reunion. Quick dry top coat or destruction IS inevitable. 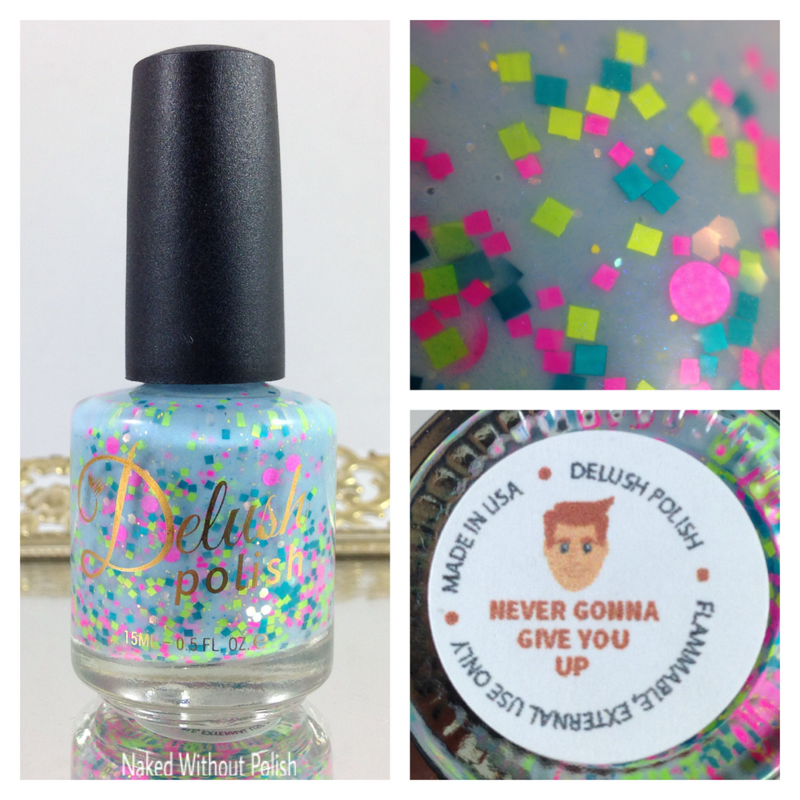 Delush Polish created Never Gonna Give You Up, named after Rick Astley's Never Gonna Give You Up. 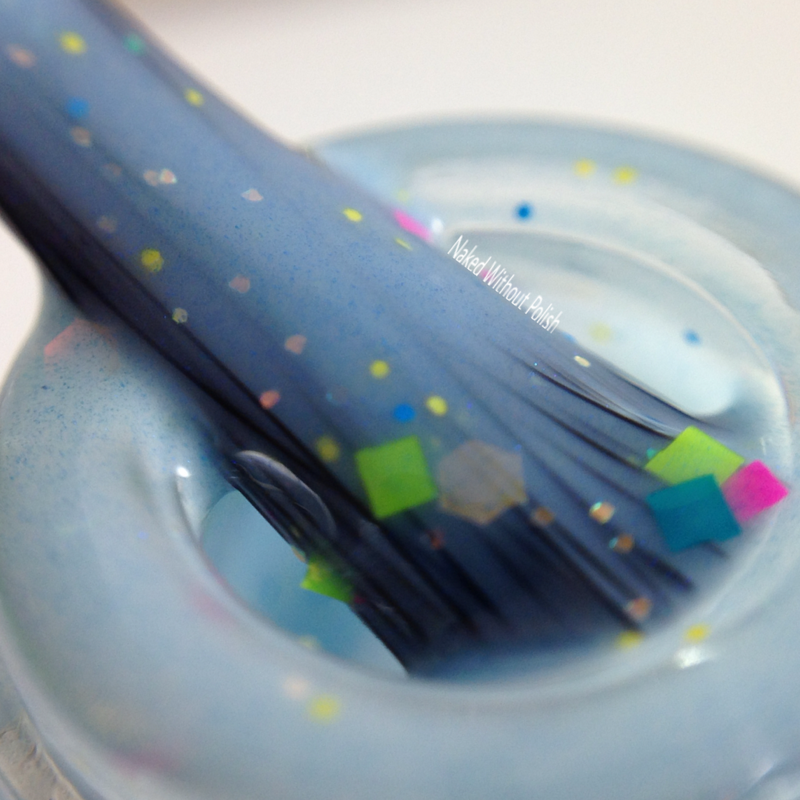 Never Gonna Give You Up is a bright sky blue crelly with matte neon glitter in lime, teal, and hot pink, as well as some iridescent glitter in multiple sizes, and a matte blue powder fine glitter throughout. Shown is three coats of Never Gonna Give You Up with top coat. Never Gonna Give You Up with never let you down. It won't run around and desert you. It will never make you cry. It will never say goodbye. It will never tell a lie and hurt you. 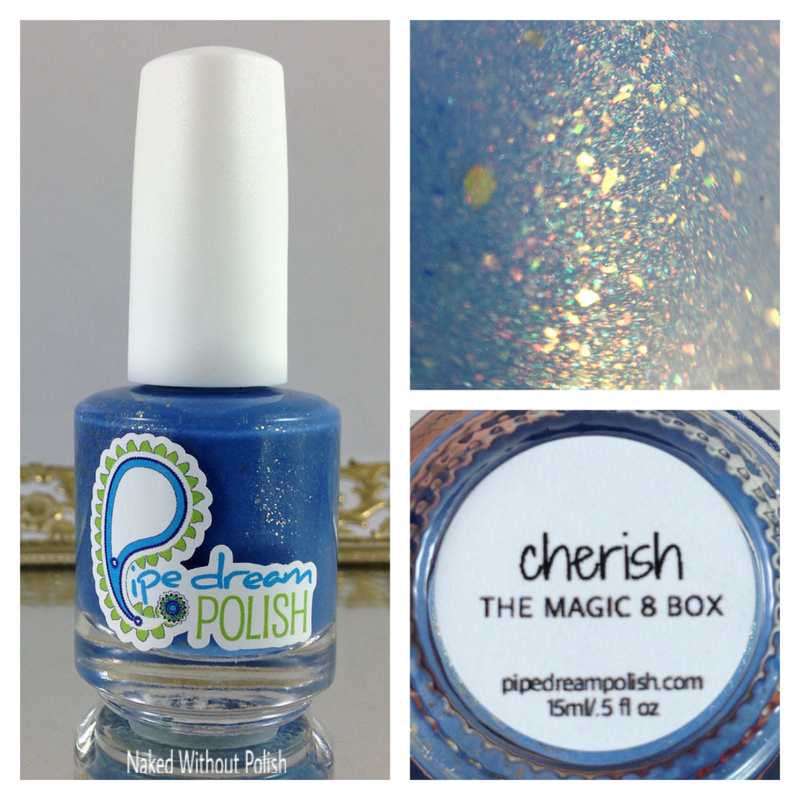 Pipe Dream Polish created Cherish, named after Madonna's Cherish. 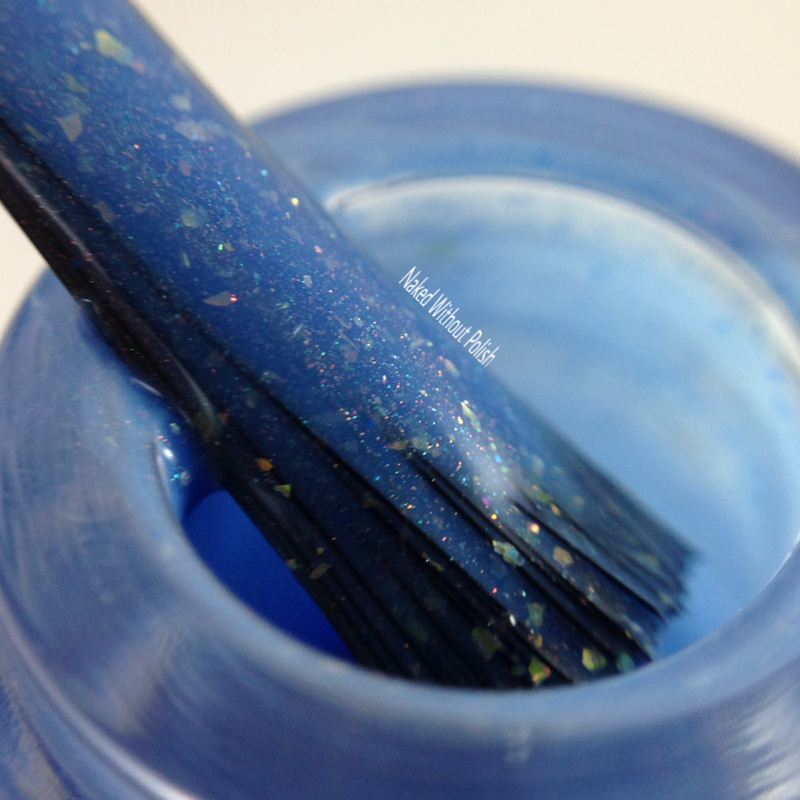 Cherish is a cornflower blue crelly with gold flecks, scattered holo, and iridescent rainbow flakies. Shown is three coats of Cherish with top coat. Cherish is one of those polishes that will instantly put a smile on your face. I have a feeling it will end up being a polish you that will want to cling to your bosom while you roll around in the water on a beach. A wonderful formula, it practically spread itself on my nail. The brush is nice and wide and fans out to almost cover your whole nail. 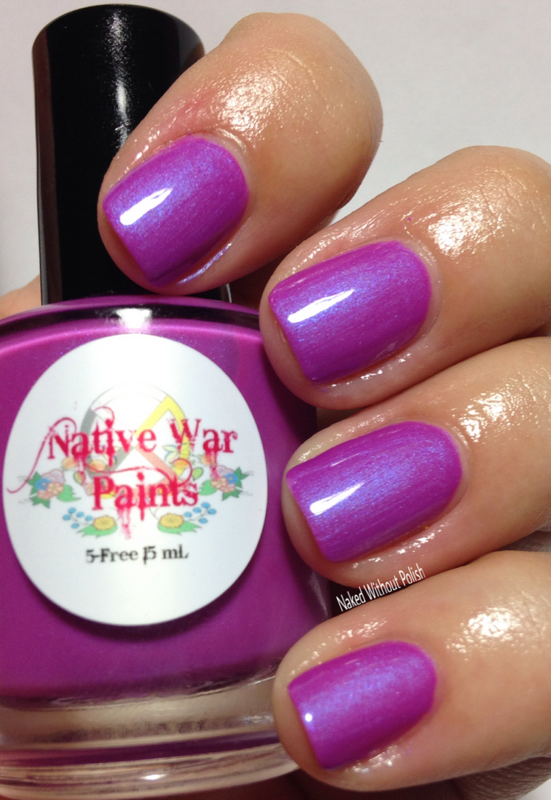 Native War Paints created Never Tear Us Apart, named after INXS' Never Tear Us Apart. 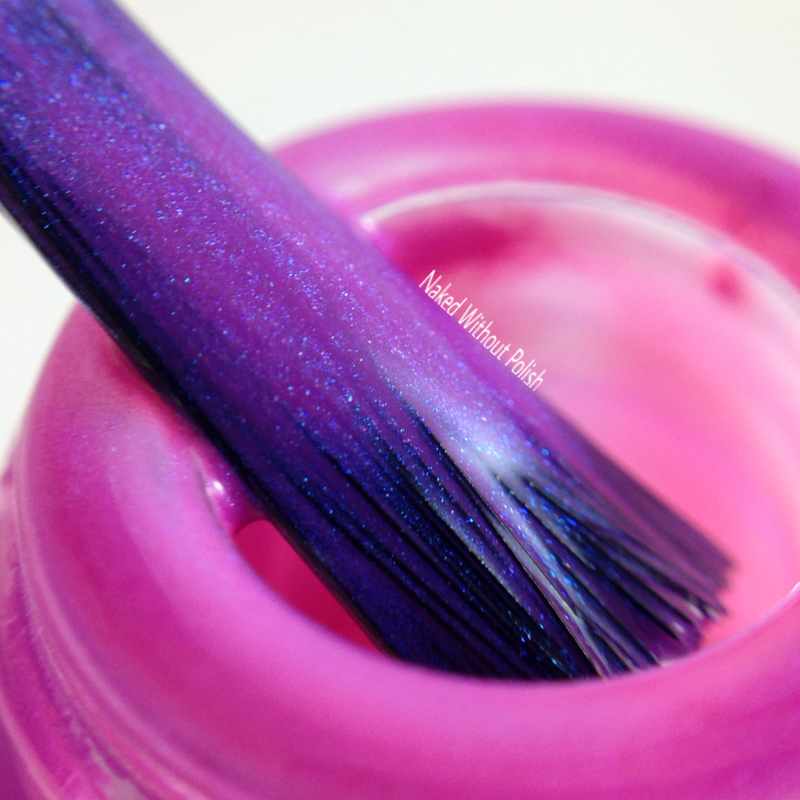 Never Tear Us Apart is described as "a pink leaning purple with blue shimmer". Shown is three coats of Never Tear Us Apart with top coat. Never Tear Us Apart just effing glows! 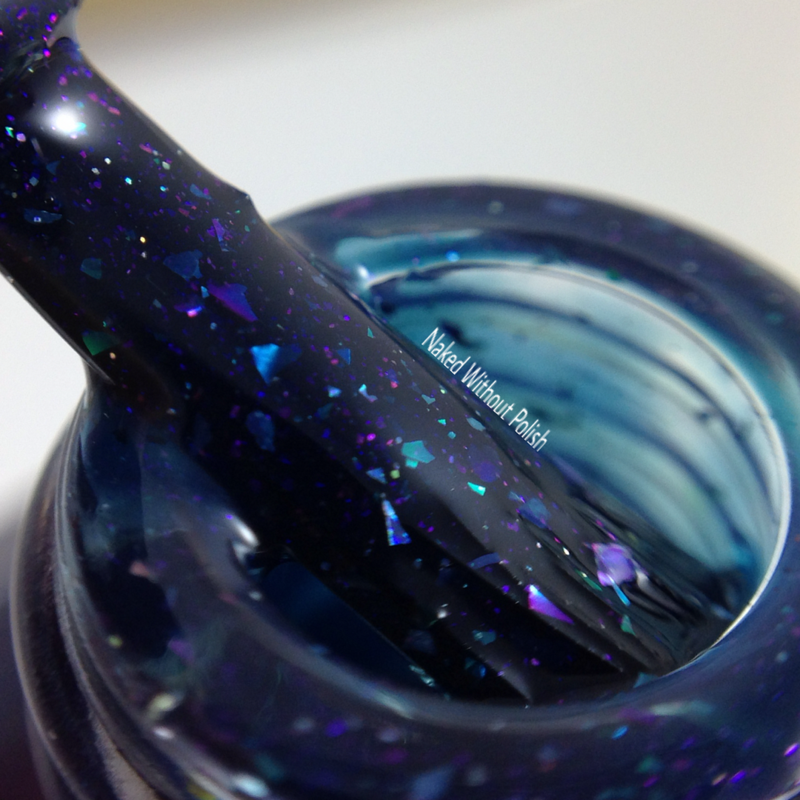 That blue shimmer is crazy. It just takes over. It's mesmerizing. I did three thin coats to ensure opacity. 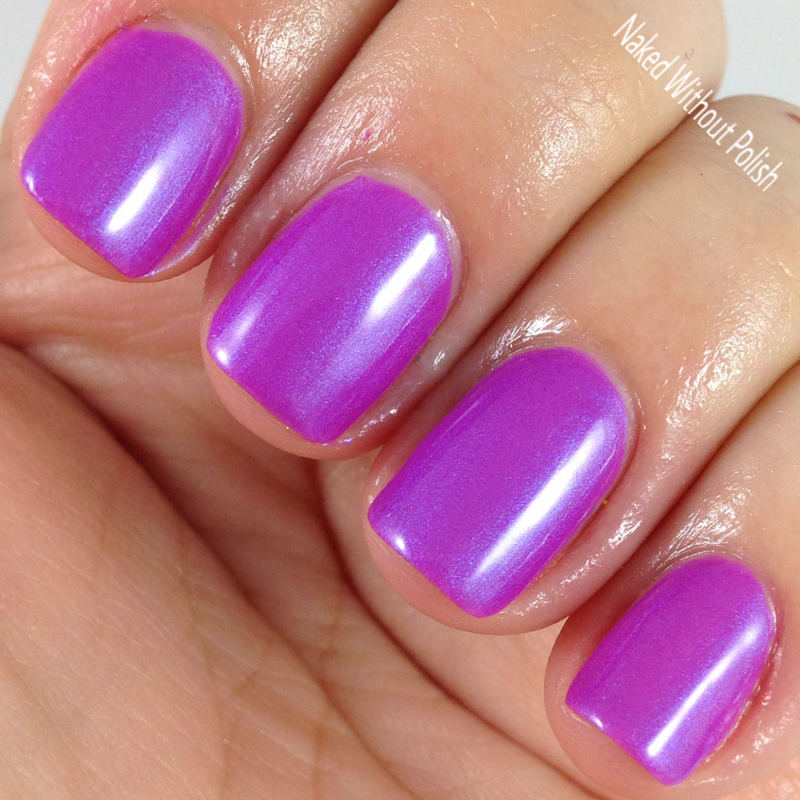 If you're a lover of all things purples or pinks...you need this polish. That is all. 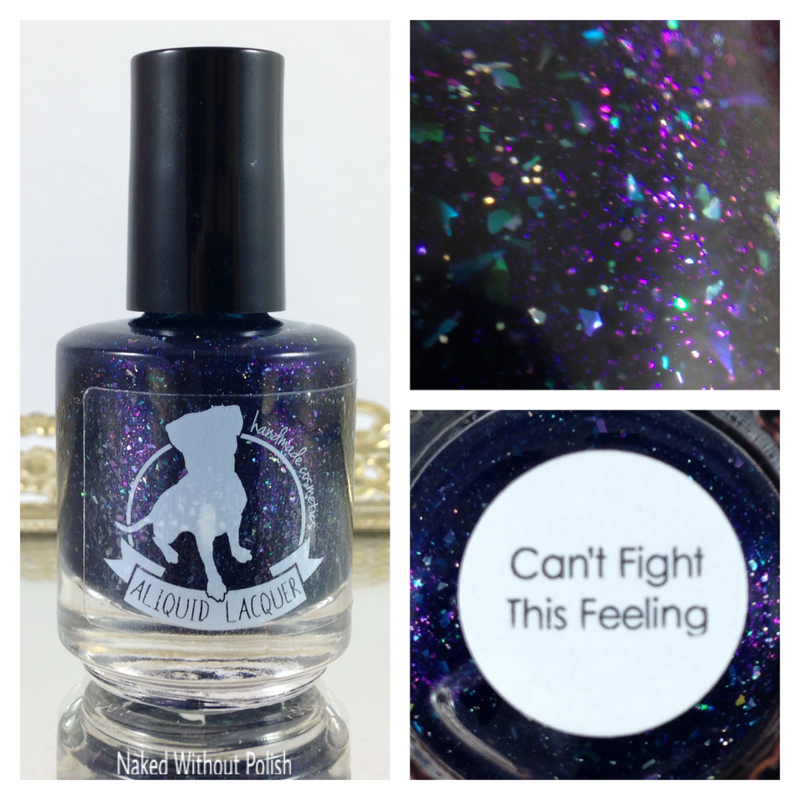 ALIQUID Lacquer created Can't Fight This Feeling, named after REO Speedwagon's Can't Fight This Feeling. 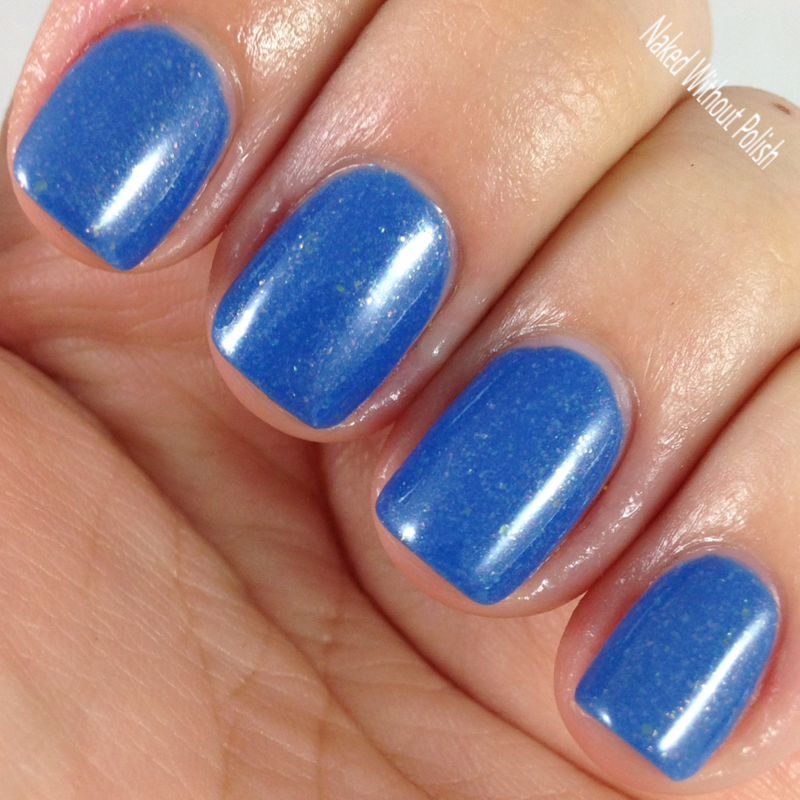 Can't Fight This Feeling is described as "a dark blue jelly with UCC and holo flakes and purple shimmer". Shown is three coats of Can't Fight This Feeling with top coat. Can't Fight This Feeling is the polish that looks like the depths of your soul. 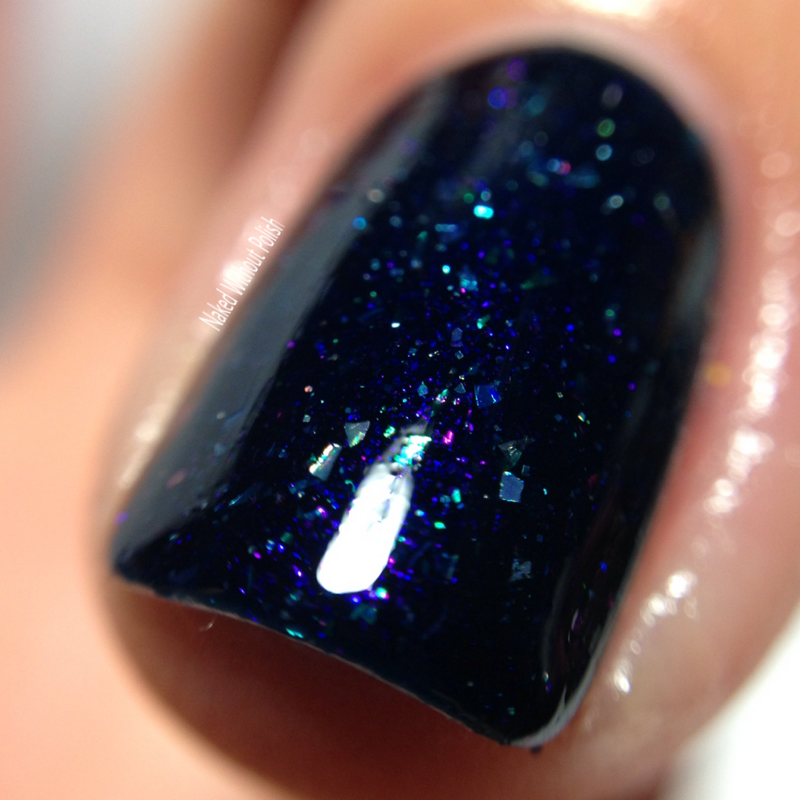 It's a haunting dark blue filled with flakes and shimmer that creates a wonderfully mysterious polish. It practically jumped out of the bottle and onto my nails. I really can't even describe how this polish makes me feel. It's all sorts of wonderful. You need to do everything you can to get this stunning Magic 8 Box. 1 may be the loneliest number, and 7 may be lucky, but 8 really is the magic number. All the brands in the box are either 3-Free or 5-Free. The Magic 8 Box will only be available Monday, February 8th through Tuesday, February 16th. 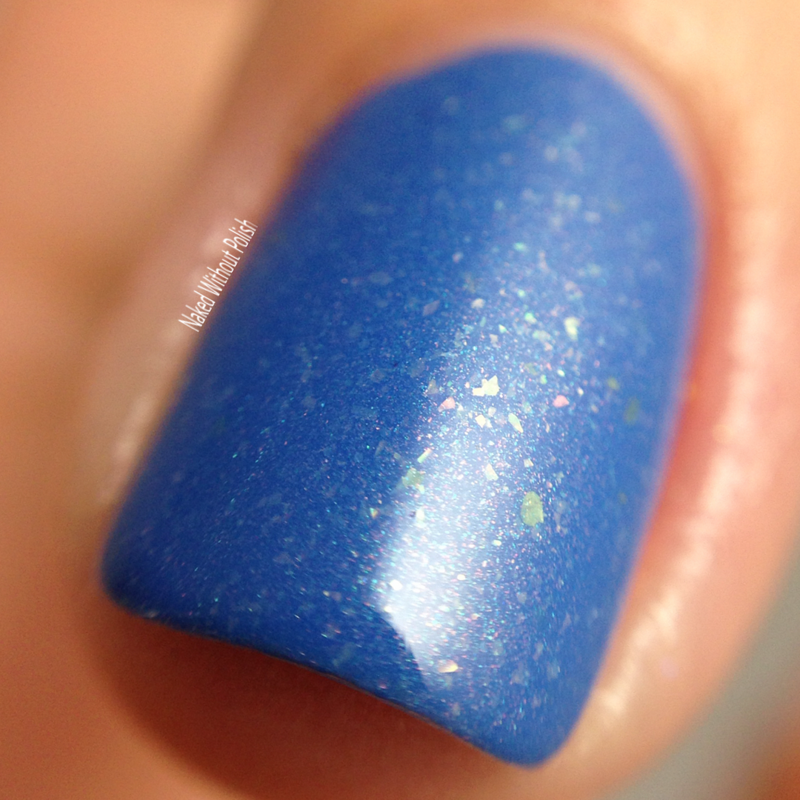 You will be able to purchase it HERE at Philly Loves Lacquer for $59 + shipping. There will only be 50 boxes so act fast!! Only want one? People are already splitting boxes in some groups on Facebook, so get in on that! What do you all think of this box? Is this one you're going to be getting? Do you have a favorite?